I have to indulge myself is the odd indie game now and then. The market’s flooded with big budget disappointments and seeing what an unknown developer came up with for Steam can be refreshing. This time around it is Sproggiwood, a turn based rogue-like with a healthy amount of challenge. The game is rather small but it still has quite a few hours of gameplay to experience. This game is far from perfect, but it does get the job done and it is exactly the kind of game you would expect it to be. 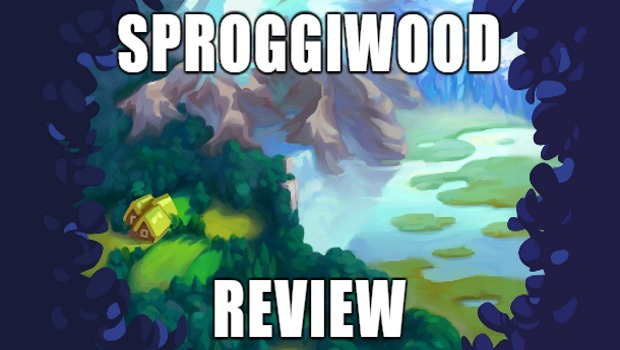 Here’s our Sproggiwood review! You play as a farmer that finds a portal to another dimension on his land. Upon entering said portal you become the prisoner of a forest spirit called Sproggi. As such, he made a village for you and tasks you with capturing the creatures of his realm to populate the village. The story is pretty cute and can be pretty funny at times when Sproggi doesn’t get his way. The lore of Sproggiwood is based on Finnish mythology and I like it. Games that stray from taking the easy, familiar route of Greek mythology are always worth a little praise in my book. It is interesting to see what kind of stories different cultures tell. While I know nothing about Finnish mythology, I would love to find out because of this game. 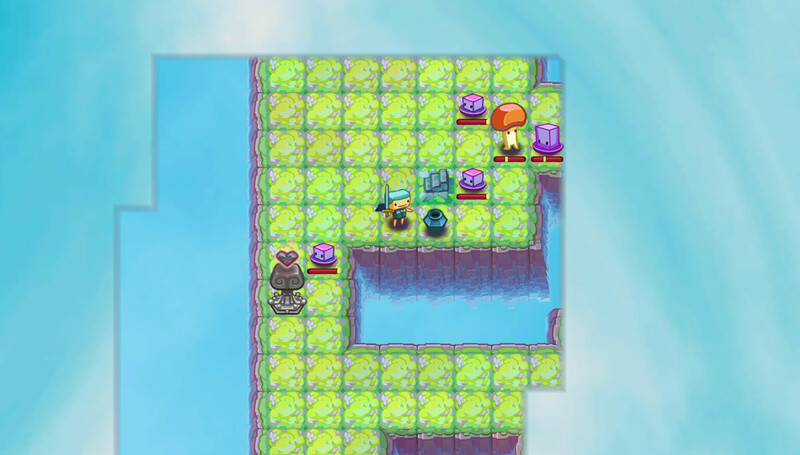 Sproggiwood‘s gameplay is turn-based. As you fight enemies, you level up and are permitted to allocate points into skills. Early on you will really only have three skills before you complete the level, but as the game progresses you will learn that each class thrives on a specific build path. There are six classes to unlock but it takes a while before you unlock the last two. Each dungeon is randomly generated in an attempt to keep things fresh. Sproggiwood has some great challenge. Everything is about positioning no matter what class you play as. It’s also very easy to get overrun with enemies. The slime enemies are a prime example. When they die, they leave behind slime that has an effect, and they always slide you in the direction you are facing. So if you are fighting a lot of slimes, you could potentially take too much residual damage from enemies that are already dead. Every class has a different method of attacking, but at level 1 they always start melee. The Archer class gets to use a rather useful bow once it levels up, though. There is a catch, you have to manage “mana” and early on, it may be a bit challenging to use, but when you kill an enemy you gain mana back. The Knight has ways to heal himself, and the thief can eliminate enemies quickly without risking damage. They are all incredibly varied and it is interesting to see how certain classes end up fighting the bosses of past areas. This game is not complete without equipment, thus lies my first problem. You find armor and weapons as you explore dungeons, always for the class you are using. When you collect that new sword, you can equip it and use it for the rest of the dungeon. When you leave, you have to buy it to start with it for future runs. Now I typically wouldn’t mind this because you get to keep it forever once purchased, but it takes way too long to earn enough money to buy equipment for all the classes. This makes the game too difficult too fast when you start off late game dungeons with poor equipment. 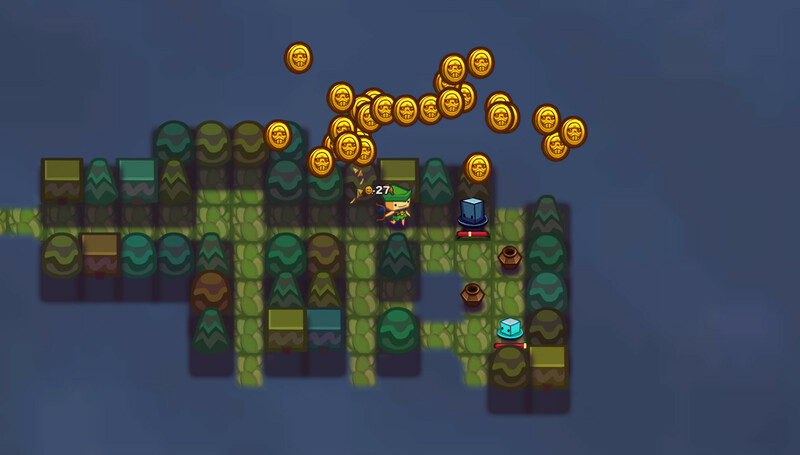 The game tries to balance this by rewarding the player with replaying old levels with new classes but it creates a repetitive environment. I understand that grinding is a necessary aspect of rogue-likes, but the game doesn’t seem to reward the player often enough, and it eventually becomes tedious. It makes Sproggiwood difficult to play, but at the same time, you don’t want to stop. You will die a lot because ways to heal are few and far between. Sproggiwood is still a fun game despite some of the gameplay faults. The cute and funny story is refreshing in an industry that seems to think dark and brooding is the way to go. The game’s controls take a bit to get used to and I would have to say my biggest problem with the game is a glitch, I think. While I would be fighting a group of enemies, I would randomly teleport around the map after using an attack. I do not know if this was a glitch or a function in the dungeon I was playing. Other than that, you get a healthy dose of challenging gameplay for $15 USD. If you love a good rogue-like, you will probably enjoy the simple approach to the genre with Sproggiwood. You can pick it up on Steam now. Next Story → Dragon Age: Inquisition Review: It’s So Damn Big!